The last several weeks have been filled with a great deal of confusion around the eurozone common debt issuance or what some refer to as "Eurobonds". Just for clarification a "eurobond" simply means any bond issued in a currency not native to the country of the issuer. For example a US company bond issued and traded in Japan would be called a "eurobond" - but our financial media doesn't want to take the time to clarify this. So for the sake of clarity let's call this concept the Eurozone Bond - a shared debt issuance by members of the European monetary union or even the EU as a whole. The general concept is that all current member states' debt would be exchanged for a single set of Eurozone Bonds. Angela Merkel continues to oppose this concept, sending shocks through the financial markets. Clearly from Germany's perspective this is a scary undertaking because the nation would be backstopping their indebted neighbors. In fact Germany's Constitutional Court ruled recently that any permanent structure that "would result in an assumption of liability for other member states' voluntary decisions" is unconstitutional in Germany. But on the current path, in the absence of the ECB becoming a buyer of huge amounts of Italian, Spanish, Belgian, and possibly French debt, the eurozone will go into a tailspin, dragging Germany and possibly the global financial system and the economy with it. Given some of the market action during the past week, this is not an exaggeration. 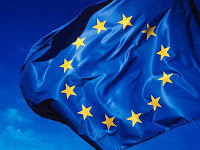 Legally the Eurozone Bond could not be implemented without significantly ratifying the EU Treaties because such issuance would be based on "joint and multiple" guarantees of the member states. The legal framework of the EU currently does not permit that. And even if EU decided to attempt such an undertaking, the political realities would make it dead on arrival - not only in Germany but in nations such as Slovakia (as we recently learned during the Greece aid debate). 1. The issuance would be backed by joint and multiple guarantees that would only partially replace current bonds that member states have outstanding. It's definitely a less ambitious project and could be implemented more swiftly, but it still requires EU Treaty changes. There is also the issue of moral hazard with such an approach because member states may not have the full brunt of "incentives" to implement domestic fiscal adjustments necessary. 2. Another approach would involve multiple guarantees without the joint guarantee, yet have some sort of credit support (such as collateral). It's not at all clear how such structure would function. 1. The excess debt (above the 60%) would be transferred to the Debt Redemption Fund gradually. For example as member states' existing debt matures, DRF would issue it's own debt to finance the newly issued member state bond. 2. All countries with debt above 60% would be required to participate. This way the Debt Redemption Fund wouldn't be viewed as a "rescue facility". 3. The program may extend beyond the monetary union members, covering all EU members. 4. In order to participate in DRF, member states would need to adhere to a strict pre-agreed schedule of debt reduction. 5. Member states that do not adhere to their austerity program would be forced to issue bonds outside of the Debt Redemption Fund that would be subordinated to those issued by the DRF. The market would quickly punish these states by forcing them to pay significantly higher rates. Other penalties could be imposed as well. This would make it politically easier for states to stick to the plan and reduce the risk of moral hazard. 6. Because such a program would be viewed as a temporary solution, it may make it easier to fit in within the EU Treaty - maybe only with minor modifications. 7. The Debt Redemption Fund concept may be more palatable to Germany because it will set in motion a mechanism that forces austerity and greatly limits the possibility that member states will "voluntarily" issue extra debt, increasing the burden on Germany. Once most of the member states reach the target of 60% debt to GDP ratio, the program can be rolled into a more permanent Stability Bond program. Clearly this is a complex undertaking fraught with numerous political obstacles, but at this stage it maybe the only path that offers a glimmer of hope.